2017 • Chief Louie named to Order of Canada, recognizing outstanding achievement, dedication to the community and service to the nation. 2006 • Chief Louie was presented with the Order of British Columbia; the province’s highest honor for outstanding achievement. 2004 • Chief Louie was presented with the award for “Business and Community Development” by the National Aboriginal Achievement Foundation. 2003 • The US Department of State selected Chief Louie as 1 of 6 First Nation representatives to participate in a 2-week tour of successful American Indian tribes. 2003 • MacLean’s Magazine listed Chief Louie as one of the “Top 50 Canadians to Watch”. 2002 • Aboriginal Tourism BC awarded Chief Louie the “Inspirational Leadership Award”. 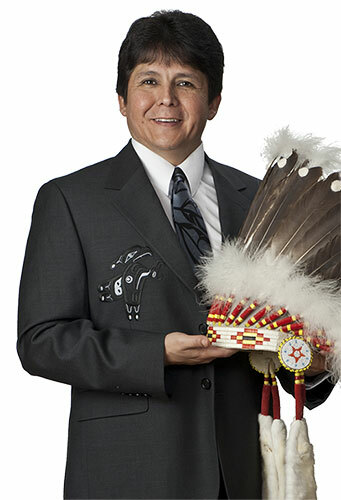 2001 • Chief Louie was appointed to the Aboriginal Business Canada Board and was appointed Chairperson of this Board. 2000 • Chief Louie was chosen to join the Governor General of Canada in the 2000 leadership tour. 2000 • The Advancement of Native Development Officers (CANDO) named Chief Louie the “Economic Developer of the Year”. 1999 • Received the Aboriginal Business Leader Award from All Nations Trust and Development Corporation.